This is a granny square swap!!! If you don't know how to make a granny square you cand find some basic crochet instructions here. 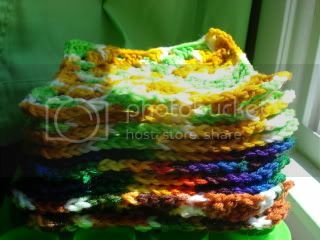 Swappers will be crocheting thirty 7 inch granny squares and will be partnered with 5 people and sending them each 6 squares. All motifs MUST be made in 4-ply worsted weight acrylic yarn, or if you're in the UK the yarn equivalent will be 10-ply aran. Please be sure to check your gauge to make sure your motifs are the correct size. We wouldn't want to receive some motifs that are 6 1/2" and some that are 7 1/2". Your motifs should measure as close to a 7" square as possible. Size is important!!! Weaving in the tails: The directions call for a 6" tail to be left at the end. Depending on their joining method, some folks might prefer to have that outside end woven in. There is a question on the questionnaire for you to express a preference. All starting tails must be woven in! Positive feedback on this swap will be left once your partners have all received, and once you have posted pics of what you have received. You must remember to PM the organizer when you SEND and RECEIVE (a post in the thread is not sufficient)! Please make a note in the subject of the PM with a SEND or RECIEVE. Poor communication and failure to post pics of what you received will be noted in your feedback if you do not. Thanks! If YES, what are your color preferences? Anything special you’d like your partners to know? 7. Koreena *First Time Swapper!!! 10. KismetFyrechyld *First Time Swapper!!! 7. temperamental--> myrdda, koalascout, silver_mcadams, babycakes, kittymom13 ->SWAP ANGELS NEEDED FOR HER PARTNERS! Woohoo! I just sent my questionnaire! I know we are just starting this one, but I hope that there will be more rounds. I would love to get a variety of knitted squares and a variety of granny squares (in variegated colors too!) to whip into a true scrappy afghan for the back of my couch. Completely rainbow obsessed SAHM to 3 & hoping to add #4 to our family this fall! Have old jeans, pillowcases, or t-shirts? I'll take them! I'm also always looking for the sleeves to women's long sleeved shirts! I've sent in my questionaire, too. I also like varigated colors and can't wait to see what gets put together from my 'granny friends'!! I'm sooo eager to start crocheting granny squares! Man, I would love to join this, but I can't figure out what 10-ply aran or 4-ply worsted weight is! Can it be determined by yard per meter? Also, what kind of yarn do we use? Can it be acrylic or does it have to be pure wool? I *think* 10-ply is the same as Caron Simply Soft or Red Heart yarn. And I *think* we are supposed to be using acrylic so that the end result is washable. These are just my thoughts. Oooh the granny swap sounds amazing! I must calm myself and think about joining... Also, a quick question/sugestion: I think it might be helpful to have everyone in the swap use only 100% acrylic yarn. If someone uses something different like wool it might felt while in the washing machine. Thoughts? You like my designs? Wow, thanks! Welcome! Yes, we should be using acrylic. I must have forgot to put that in there. I will adjust the first post asap. Hereis the specifications for some Vanna yarn at Lion Brand Yarn. It is a nice acrylic yarn. Im not really sure how else to answer your question. If anyone else has any tips for average_fan please add! I hope it will help you in finding something silimar to work with. Don't feel bad about asking questions! It is how we all learn! I'll be back to fill in my questionnaire!